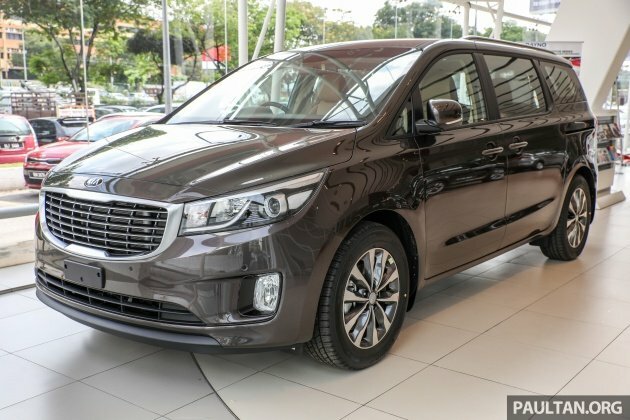 Naza Kia has announced the arrival of the locally-assembled Kia Grand Carnival, now available in two trims – KX and EX – instead of the CBU’s three-flavoured line-up. The entry-level KX, priced at RM161,191.63, now forms the base of the range, while the range-topper is priced at RM180,667.99. Both above-mentioned prices (on-the-road without insurance) are the same as before, and the company is giving more features, such as an eight-inch touchscreen infotainment system. This is an upgrade from the previous 4.3-inch touchscreen unit, and the system supports Apple CarPlay and Android Auto connectivity. This means users can now access their smartphone functions including GPS navigation, calls, messages and multimedia playback. Also part of the upgraded kit list is the addition of Bluetooth connectivity, with controls built into the steering wheel. Other standard features include electro-chromic rear view mirror, fitment of aero blade wipers as well as a new tri-zone climate control function with cluster ioniser (standard on the EX) for the cheaper KX variant. Elsewhere, the kit count for both variants remains as per the CBU version. To recap, the KX gets grey two-tone fabric seats, while the EX ups these to beige two-tone leather units. All three seat rows have their own set of ceiling-mounted air-con vents. The second-row seats fold in a 40:20:40 split, and can be slid forwards for easier access to the third row. The third row seats feature a 50:50 split. Boot space with all seats up is 359 litres, but this can be expanded up to 2,718 litres with the seats folded. For RM20k more, the EX nets one a roof rack, black radiator grille with chrome accents (plain black for the KX) smart power tailgate, machine-finished 18-inch alloy wheels, leather-wrapped steering wheel and 12-way powered seat (driver’s seat only). In terms of safety, both are fitted with six airbags (dual front, side and curtain), front and rear parking sensors, electronic stability control, ABS and hill assist control as standard. Also fitted are three Isofix child seat mounts (two on the outer seats of the second row and one in the third row). The mechanicals remain unchanged – power comes from a 2.2 litre four-cylinder CRDi turbodiesel, making 190 hp at 3,800 rpm and 440 Nm of torque at 1,750 to 2,750 rpm. The mill is paired with a six-speed automatic transmission. As with all Kia cars sold here, the Grand Carnival comes with a five-year/unlimited mileage manufacturer’s warranty and the company’s ‘Value 5’ smart financing package. Find out what we think of the 5.1-metre-long eight-seater in our video review below, and to find more details about the locally-assembled Kia Grand Carnival, check out CarBase.my for a full list of its specifications. Rm181k is so high. It is really too high. Especially for a Korean car. What happened to AFTA and the zero tax treaty for ASEAN cars? When is gomen going to reduce car prices. We cannot be having the highest car prices in the world when only 76.3% of all EPF contributors earn only RM1500 and below. The previous generation, naza ria @ kia carnival CKD was less than 110k brand new. Same $$, better buy Hyundai Starex 11seater. same price, more features, fewer sales. Starex? Good luck. Yes the fuel is quite impressive even with euro 5 but sakit bdn if long distance drive. I owned one and will change to this GC. And another thing is Starex quite bising with all those seats if you drive alone and the luggage space is a big turn off. Tax the rich no problemo. Fit and finish, NVH of the Grand Carnival is better than the previous-generation Alphard/Vellfire, but definitely not the current models. Would you buy a almost similar looking LV bag made by koreans with so called similar quality selling for 10% less than the real LV? 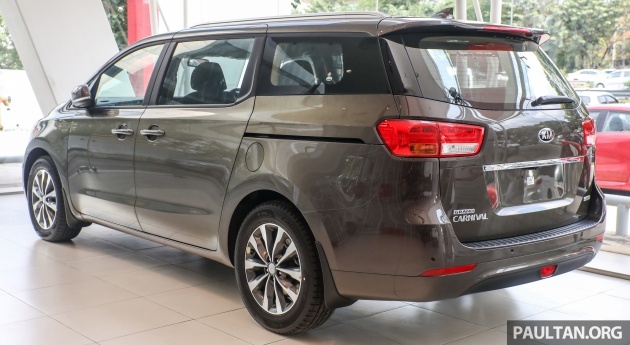 I suppose KIA is learning from its mistakes of selling the CKDs at a lower price than the CBU, leading many to fault Naza KIA for the massive depreciation of thier CBUs. The last few models sold the SKDs (basically CBU without bumpers and wheels) for the same price as the CKD. The problem is, why hasn’t Naza KIA given more kit other than the AV headunit coming down from a CBU to a CKD? Why are they cheapening out now? Did I get it wrong? The EX cost 20k more for just the addition of leather seats???? The EX also adds on roof rails, machine-finished wheels, powered driver’s seat, leather-wrapped steering wheel and powered tail gate. It used to have three-zone climate control over the CBU KX’s manual AC, but that’s changed now. U mean the entry-level KX at RM161,191.63 do NOT have powered driver’s seat ?? Looks like Naza KIA is being stingy for a Not that cheap MPV. Seems a lot of money to pay for leather, a power tail gate and roof rails (which almost no one uses – and makes it worst for fuel economy and wind noise) don’t you think? Yep, the additional three-zone climate control vs all manual affair in the CBU range justified the price difference better. Now that’s nullified. i worked with NazaKia some 15 years ago. actually, the cars are cheaper to buy CBU from korea rather than CKD. the cost for a CBU Kia Spectra was less than 10K (not CIF). even after 300% import tax (applying rules that time) the car price was between 40-50k. but govt forced naza to sell higher (new price back then 84K) as to not kacau P1 and P2. naza decided to bring the car and CKDed is as part of CSR (to provide jobs and business opportunities to vendors etc) and manage to reduce the prices in terms of taxes. but the actual cost for them to assemble the cars are higher (jigs and tools for assembly plant) which can be millions of ringgits and adding more cost for each car. Why NKM doesn’t include the diamond grill, chrome arch at front bumper and chrome at window sidelines…like the first photo in this post. Without them the car looks dull despite all the fantastic features and engine. From CKD to CBU should give 15 to 20K price reduction, instead of offering lousy upgrades which are not needed by most buyer. Even with the extra kit, it is overprice. why they never bring in the better look front/rear bumper and the front grill? Look at the black Carnival in your cover photo, compare to the one in photo gallery. Could have been slightly cheaper if u ask me and it still does not come with led headlights…. Still expensive even CKD… Naza x rebadge kepada next generation Naza Ria 2018 ke? Come on, was expecting a price drop.. I bought the EX unit back in September. Got my car in October. Only RM4k discount with 3 years free maintenance and some freebies (although the sales person never give me the smart tag he promised). I have tested both this and Sorento before buying. 4) Spacious and user friendly storage area. I always change baby diapers or put large items at the back since d back seats are easily folded. 1) I don’t like the way the steering feel. Sorento has much better steering feel. 3) A little noise on the right wheel during slow drive thru uneven surface. Will get Kia to check on that. 4) Not so good service from the service centre. Waiting for 2 months to get the free service letter. So I end up paying myself for the first 1000km service. Up to now the service centre hasn’t reimbursed me the service fee I paid. 6) Late launching. Already launched in oversea about 3 years ago. Overall this is a great MPV to drive large family members. It is excellent and really comfortable for long journey and highway drive. But for city drive it is not good as you will tend to hear the engine sound at low speed and it is not easy to park. recond Alphard much smarter choice there. MPV is never meant for city driving due to its size. Kia has come a long way since he introduction of Sephia and Spectra. I live in Saudi since 2008 and my current drive is Kia Cerato 2014 (bought in 2013) or KX model in Malaysia. So far this is one true car that I can say buy and drive. The only major expenses so far for me was changing all 4 tyres after 5 years (owing to less travel, mainly city driving and occasionaly trips to Mekah or Madinah). But the service centers here also are the same. So far I had one visit for my 20k services and for changing the oil and filter I opted for Petromin coz in Saudi there is a ruling that using 3rd party shops for normal services would not void your warranty.I guess this is not just confined to Malaysia more like global issue and Kia has to rectify this. At least not like BMW. Only less 10k after CKD the 5 series, no added new feautures BUT they taken out the adaptive cruise control??? So? To buy it or not to?